대방광원각수다라요의경은 줄여서 ‘대방광원각경’또는 ‘원각경’이라고 부르기도 한다. 이 경전은 훌륭한 이론과 실천을 말하고 있어 널리 유포되어 불교 수행의 길잡이가 되었다. 이 책은 원각경에 당나라 종밀(宗密)이 간략하게 주를 달아 해설한 것으로, 목판에 새겨 닥종이에 찍었으며, 크기는 세로 29㎝, 가로 17㎝이다. 원래 두루마리 형태로 만들기 위하여 1판에 20행씩 새긴 것을 10행씩 찍어내어 책으로 만들었다. 권 하가 떨어져 나가서 책 끝에 있는 간행기록을 잃어 버렸으므로 정확한 간행시기를 알 수는 없다. 그러나 송나라에서 보낸 목판으로 찍어낸『대방광불화엄경소』와 판의 형식, 글자체, 새긴 기법 등이 비슷하여 송나라 판본을 입수하여 새긴 고려시대의 판본임을 알 수 있다. 권 하가 떨어져 나갔으나 송나라 판본을 보고 새긴 고려시대의 목판본이란 점에서 가치가 있다. As a widespread guidebook of ascetic practices, Mahavaipulya purnabudha Sutra (Complete Enlightenment Sutra) deals with the discipline and practices of Buddhism. 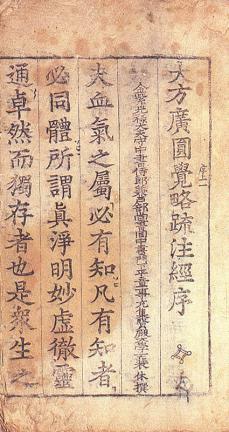 Buddhist Monk Zongmi of the Tang Dynasty of China added explanatory notes to this sutra, and it was carved on woodblocks to be printed on mulberry paper. It measures 29cm long and 17cm wide. With the intention of printing it in a scroll, the original woodblocks were engraved with 20 lines but were divided into two; every 10 lines were printed on mulberry paper. The exact date of publication of this book is unknown because the record went missing with the loss of the later part of the book. 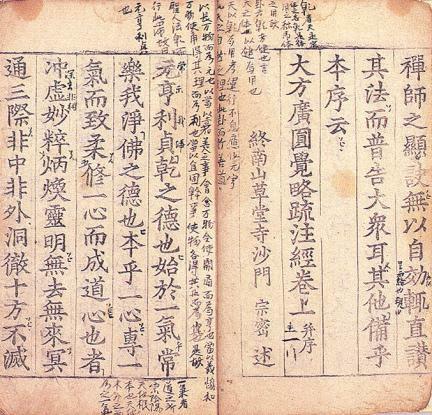 In terms of the style of woodblocks and font of the letters, however, it is similar to the Commentary on the Avatamsaka Sutra (Flower Garland Sutra) published using the woodblock imported from the Song Dynasty. 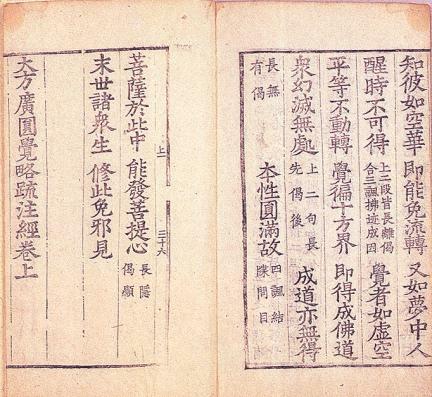 Even though the second volume is missing, it is deemed valuable as a publication made with Goryeo woodblocks engraved based on the ones from the Song Dynasty.